Andy McMillin is a third-generation off-road legend in the making, and the youngest person in history to win the highly coveted Baja 1000 race – the longest in North America. Mad Media joined Andy’s race program in 2005 to help elevate his recognition both here in the US and in Mexico – and to maximize every marketing opportunity for his race team and sponsors. 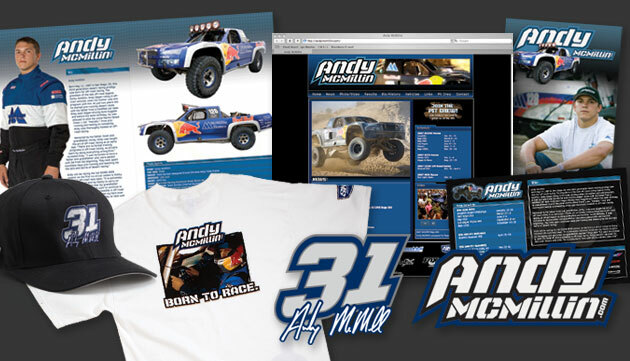 We assembled a unique marketing plan for Andy that combined traditional and guerilla marketing tactics – and helped him obtain a massive following in the off-road community and beyond. The Mad Media web division created a comprehensive website that included news, information, bio, photos and video. We also created an ongoing “Win a ride with Andy” contest as a way to build a database of fans. We created an “event activation package” that included stickers and signature cards, as a well as a comprehensive media kit. The media kit included a CD-R with ready to use bios, photos, and videos of Andy. The Mad Media Film department created a highly customized viral web film of each race Andy competed in. We posted these films to Andy’s website within forty-eight hours of each race. We then spread the web films across the Internet to video sites such as “Youtube” drawing thousands of downloads. To date, each of Andy’s web films have been viewed tens of thousands of times. Press releases were created before and after every race so we could maximize Andy’s exposure online as well as in print media. Team merchandise is a critical part of any successful marketing program. We created a multi-piece merchandise program for Andy that included unique t-shirt designs and a custom embroidered hat. The goal was to keep Andy’s fans dressed in quality clothing that showcased his team and sponsor logos.